K-State Libraries have textbooks and other course materials for many of K-State's courses. Hale Library's Course Reserves collection is now available at the Library Help at the Union Desk, which is located on the 1st floor of the Union near Radina's. Current K-State students and employees can borrow these items for short periods of time (usually 2 hours, but sometimes longer) by visiting the Library Help Desk where they are kept. Go to the Libraries' Home Page. Click the Course Reserves button below the search box in the center of the page. Enter the title of the book or the course code (e.g., ENGL 100). Each of the K-State Libraries has a collection of current periodicals. They cannot be checked out and taken from the library, but you are welcome to read them in the library. Each library also has copiers and scanners you can use to capture articles you want to read later. Hale Library's current periodicals have all been cleaned and deodorized and are now available in the Math/Physics Library (Cardwell 105). 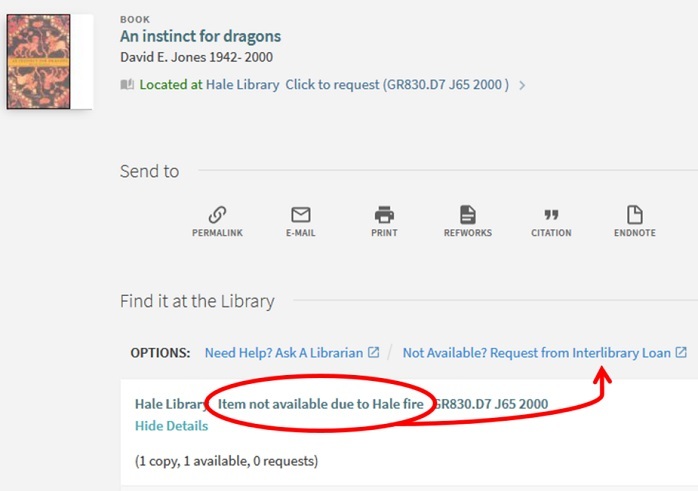 With the exception of course reserves and current periodicals, all the physical materials that were housed in Hale Library at the time of the fire (4 pm on May 22) are not available. Over 1.5 million items are being inventoried and removed from the building for cleaning, and will not be available for the 2018-2019 school year. You may request these materials via Interlibrary Loan. We encourage K-State's students and employees to use our Interlibrary Loan Service to get materials that are not available. For articles and book chapters less than 50 pages long, we will do our best to deliver it to you electronically as a pdf. These deliveries usually happen in a matter of a few days. For longer articles and book chapters, as well as loans of entire books, CDs, DVDs, etc, we will try to borrow for you from a partner library. In most cases, we can get these items to you in a week or two. Sometimes it will take longer. We will email you to let you know when the item has arrived and to tell you how to get it. In the rare cases when we are not able to get the item you need, we will e-mail you to let you know that we have exhausted all our options. The materials located at our four branch locations (the Math/Physics Library, Weigel Library of Architecture, Planning & Design, the Veterinary Medical Library, and K-State Polytechnic Library) and those at the Annex, our offsite storage facility, are still available. See our Hours and Locations page to learn more about those branch libraries. Our discovery tool, Search It, indicates where our physical materials are located, and it also shows whether the items are available to be borrowed. If they are available for borrowing, you can go to the branch library where they are located and use your K-State ID or community patron card to check out the items. If you would like to pick up an item at a branch library that is different than the one where the item is located, you will need to sign in to Search It and use the request retrieval link for the item. You can find that link on the Find it at the library tab below the title. If the material you want is located at our Annex, you will need to sign in to Search It and use the request retrieval link for the item. You can find that link on the Find it at the library tab below the title. K-State has institutional agreements with organizations that allow faculty to browse and borrow books at many universities across the United States. The Libraries will work with any faculty who is interested in borrowing resources at those universities. If you are interested, please contact libhelp@ksu.edu or simply Ask A Librarian. Current K-State faculty, staff, and students can access and even check out materials from other libraries. When signing up for a card, ask for guidelines about how long you can check out materials, if you can renew them, where they have to be returned, and if there are fines! For your first visit, call ahead and make sure you have everything you need to get a card and what days/times you can sign up for a new card. A library card is available for $5. You may check out up to 5 MAIN books for a 30-day loan, with one 7-day renewal. Bring a photo ID and something with your name and current street address (bill, processed mail, etc) and get a library card. It's free for anyone in the community. Bring your K-State ID and sign up for a library card at KU. You may also need something to prove your current address, such as a utility bill, bank statement, credit card statement, or rental agreement (needs to have your name on the document).